The training will be in English with Czech translation. We meet every day (from Wednesday till Sunday) from 10:00 a.m. till 6:00 p.m. with a lunch break. Have you ever thought of coming to Prague? The heart of Central Europe and one of the most beautiful cities in the world. Now you have a chance to enjoy the city while attending an exclusive training with an Indian master in marma therapy! We will learn about individual marma points, their effects. ways of manipulation and treatment with special massage strokes. 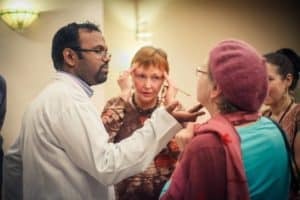 The training is open to all without any Ayurvedic knowledge as it includes an introduction to basic principles of Ayurveda that is necessary for marma therapy practice. A marma therapist must be able to control his own energy, and that is why we will dedicate time to breath and concentration exercises to develop our senses and perception. The training is recommended for ayurveda consultants, massage therapists, bodyworkers, healers, therapists of other traditions, yoga teachers and anyone interested in energy work. Ayurvedic therapists and students will deepen their knowledge and learn about marma points and their effects that are not generally known. Marma therapy is a practical skill with its roots stemming literally from the battle field. It has been used and developed by warriors and fighters who need an effective tool with an immediate effect. For the most part, this knowledge is not recorded in writing and is transmitted from teachers to their students. The training will give you extra tools for your professional toolkit that you can use in your practice right away. Dr. Neel Venugopal is an Ayurvedic Physician, marma expert and a great teacher who knows how to share his unique knowledge and enthusiasm. In his practice, he uses over 300 marma points. It was his destiny to start his studies when he was 6 years and found his first teacher. It is a tradition that teachers start sharing important knowledge with their pupils only after 12 years. Thus, Dr. Neel Venugopal continues in a tradition that is many hundred years old and holds precious wisdom which is not available anywhere else in a written form. He is the founder and director of an Ayurvedic Clinic in Kerala, India, and gives private consultations. It includes lectures, practical classes, teaching materials, consumables. or any other costs you might incur. The training is in English with Czech translation. There will be max. 16 students in the batch! The place is close to the city center, next to a beautiful park and with many accommodation options and restaurants and cafés. and are ready to help you with finding your way around!